Unfortunately roofs get to a point where repair is no longer an option. Our free estimates will give you the replacement options needed to protect your investment. We will provide an in home consultation to determine colour and style choices, ventilation information and manufacturing warranty information. 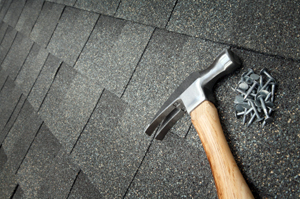 All shingle manufactures offer guarantee / warranties on their shingles which range from 15 years to limited lifetime. MP roofing guarantees that every roof installed will comply with the manufactures recommendations and specifications, maximizing the life of your roof. The laminated shingle is the primary shingle we install. We do install other brands, styles and quality upon request of homeowners. When we replace the shingles we also do a complete roof system with all new accessories ie. Vents, plumbing stack flanges, drip edge, etc. To ensure meeting proper warranty installation as per manufactures specifications we install an underlayment. We even go above and beyond the minimum code and install a synthetic or self-adhering underlay. This roofing material adds durability, additional waterproofing and life to your roof. Plywood replacement is only needed when the under sheeting is rotten due to dry rott, moisture (inadequate ventilation) or water damage. Plywood is always on hand at the job sites to replace any damaged sections immediately. When replacing your roof, the Chimney is often an over looked accessory. At MP Roofing, one of our experts will custom bend an Aluminum Chimney flashing that is not only function. But adds a distinguishable touch, matching or complimenting the rest of your exterior decor. We provide installation and repair for most flat roofs. When replacing a flat roof we mainly recommend a self-adhering 1 or 2-ply membrane or a Modified Bitumen. For a Free Estimate, please call OR use the form below. We will reply to your request by the next business day via phone or email.